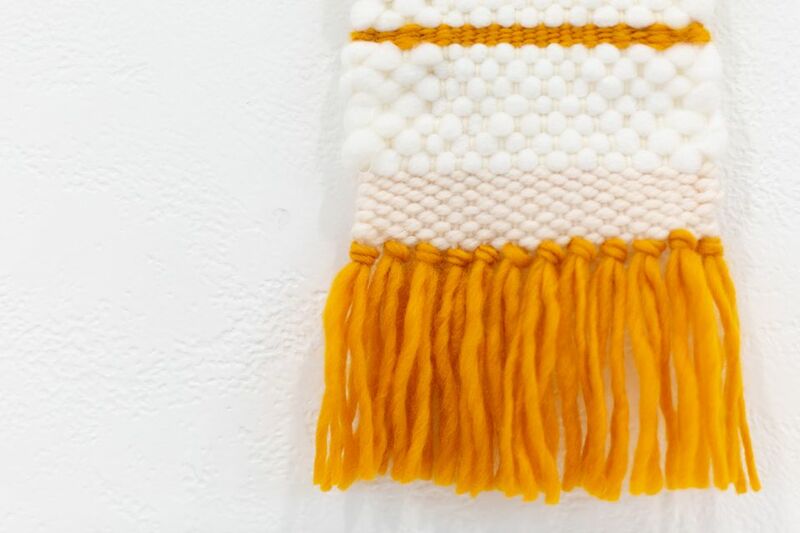 Fiber arts and weaving are having a major DIY moment! There are beautiful woven wall hangings everywhere you look. This simple tutorial will break down the basics of creating your very own weaving, even if you've never touched a loom! The end result is a simple but beautiful fiber art piece that you can hang in your home or gift as a handmade gift. While you're gathering materials, search for a small lap loom for your first few weaving projects. Once you're proficient at the basic technique, you can look for a larger loom and create larger projects. A loom with somewhere around 12 pegs is the perfect size for a beginner. The warp is the initial yarn that you wrap around the pegs. Create a loop on one end of your yarn and loop it around the upper left peg. Bring the yarn down and around the lower left peg, then up and down around each peg in turn until you reach the bottom right. Create another loop and loop it around this peg. Your warp should not be too taut; this will leave room for the yarn throughout your weaving. Cut strands of yarn for your fringe. You'll need one strand for each peg on your loom, so we created 12 strands, each 20 inches long. Take one strand and fold it in half, then half again. Insert this strand under the second line on your warp, toward the bottom. Pull the opposite ends of the strand over the warp line and through its own loops. Pull to tighten, then slide the fringe that you've created down until it is underneath the lower left peg. Continue this process for each peg until you have fringe all the way across the bottom of your loom. Now insert your shed stick. Your shed stick can be anything that slides easily between the strands of the warp and creates some space between the lines. To insert, slip it over one strand and under the next, all the way across the warp. The shed stick makes it easier to slide your needle through the warp as you weave. It also is useful to compact your stitches down and keep them nice and even. Begin weaving. Cut a length of yarn about three feet long and insert one end through the eye of your knitting needle. Use the shed stick to separate the lines of the warp and insert the needle from one side all the way to the other so that the yarn alternates every other line on the warp. Leave a tail of about three inches on the other end of your yarn. On the way back to create a new row, the yarn should now weave over and under the warp strands in the opposite order as the previous row. So if you finish your first row under the final warp strand, bring the needle up and in front of that same strand, then weave under the next strand in the warp, and so on. As you add new rows, you'll want to press your shed stick down onto the rows to keep them even and compacted. In general, keep your weaving rows somewhat loose so that the edges of your weaving don't pull in and pucker. Continue in this manner until you'd like to change yarn. Changing yarn is simple! Just leave a 3" tail on your final row of your current yarn. Then, start a new row with a new yarn using the same process that you used when you began your weaving. Just be sure that you weave in the opposing over-under order as your previous row, and always leave a tail on both ends of yarn. Once you near the top of your weaving, you may have to remove the shed stick. If you do, you can use the tines of a plastic fork to press your rows together. Once you're about 1 1/2 inches away from your pegs, stop weaving. Turn your loom over and pull all of the hanging ends toward the back. To hide them, take one end and thread it through the eye of your knitting needle. Use the needle to thread it through a stitch on the back of your weaving. Trim the excess ends. Repeat with all hanging ends until everything is secured and hidden. One by one, transfer the loops from the top of your weaving onto your dowel. Take one loop off, put it on the dowel, and wrap the loop around the dowel again to take up the slack. Repeat until the entire weaving is transferred to the dowel. Use scissors to trim your fringe to your liking. Cut a length of yarn and tie it to either end of the dowel to create a hanger. 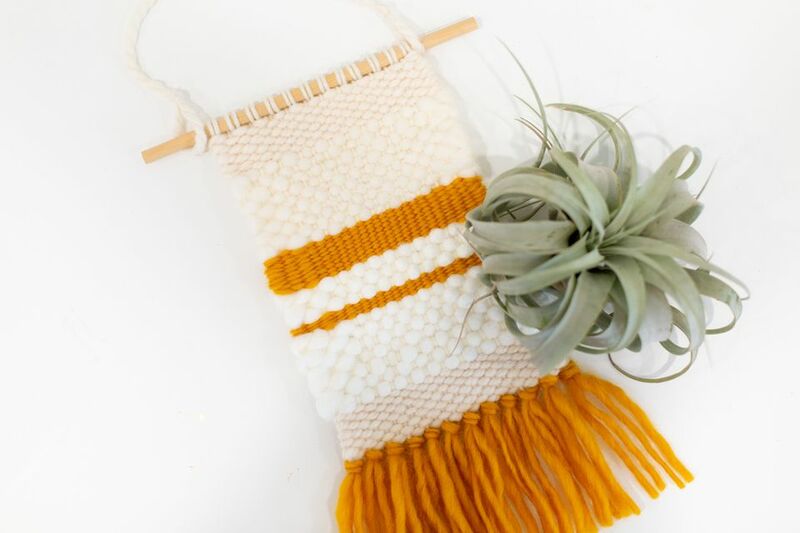 Hang up your weaving and let it brighten your space!